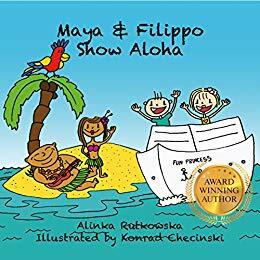 Maya and Filippo live with their parents on a cruise ship named Fun Princess. The author provides clues for their next destination and invites young readers to guess. She describes the islands of Hawaii and talks about the language, customs, and culture. As the children arrive at Waikiki beach, readers learn about the ukulele, the flower lei, the hula dance, and the meaning of the word aloha. It does not simply mean hello and goodbye but describes the philosophy and way of living in Hawaii. The family spends a day at the beach before heading back to their cabin on the ship. Before ending their day, the children will have the opportunity to attend classes onboard to learn more about the hula dance and play the ukulele. This book is colorfully illustrated in a cartoon-like format. Young would-be travelers will enjoy taking an armchair vacation with Maya and Filippo. I would especially recommend this book for children ages three through six.